Have you noticed that one or more of your toenails have become thicker than your other nails, or they are becoming increasingly harder to cut? As someone who’s been through this myself, I’m here to provide you with all the information you need, from what can cause your toenails to thicken, how to care for and treat the condition and tips for preventing it from reoccurring. There are a number of different reasons that this could occur, with the most common one being a fungal nail infection – the medical term for this being Onychomycosis. Almost 10% of the adult population in most western countries (including 35 million Americans) have a fungal nail infection on one or more of their toenails, and it’s the cause of about half of all nail related issues. Other than a fungal nail infection, thick toenails can also be caused by a trauma to the nail, which has the medical name of Onychauxis. This doesn’t necessarily mean it has had something heavy dropped on it, or that your foot was trodden on, as it can also be caused by things like poorly fitted shoes which cause the nail to rub against the shoe repeatedly. Another cause of thickened toenails could be a medical condition, such as diabetes. One of the side effects of diabetes is poor blood circulation, especially to the lower extremities. As a result of the poor blood flow to your toes, the skin and nails do not receive the required nutrients to grow properly. Psoriasis is another medical condition that can cause nails to thicken, and is typically characterized by areas of red, raised and flaky skin that may look like scales. This condition can cause the finger and toenails to exhibit sections of pitting, thickened growth or irregular nail contours. Finally, as we age, blood circulation starts to diminish which can cause the same results as described above for people with diabetes. If your thickened nails are caused by a fungal infection, there will also be a discoloration of the nail at the same time, typically a yellowish/whitish color although it may also turn green or black. You may also notice that the nails are brittle, they may have ridges in them and they could also be rather sensitive or painful when they are touched or when you try to cut them. Another good sign that your thickened nails may have been caused by a fungal nail infection is if you have recently had a case of athlete’s foot/tinea. The fungus that is responsible for an athlete’s foot infection is the same strain that likes to eat away at your toe nails and causes unsightly thick toenails. If your thickened toenail was caused by a sudden impact trauma, you may notice that this is just a small (or large) bump in the nail that is growing out normally, with a more regular looking section of nail growing both above and below it. If you’re unsure about whether you have a fungal nail infection, I would recommend that you speak with your doctor or pharmacist to get a professional opinion. The correct course of treatment for your thickened toenails is really dependent upon the underlying cause. For all cases of thickened toenails, some careful work with nail cutters and a nail file can help to reduce the thickness of your nails and assist with the appearance – although if you don’t feel comfortable with doing this yourself, a podiatrist can also do this for you. Most will also have a mechanical tool to grind down your thick nails, which can be quicker and less painful than using a nail file at home. While this can improve the appearance of your nails, it won’t address any underlying issues. If you have a fungal infection, you will need to be extra careful when cutting your nails, as they may split down the middle because they can become very brittle. Soaking your toes in warm water before you cut your nails can help prevent this by softening the nails and making them easier to cut. Be sure to clean any tools that you use with 70% isopropyl alcohol to prevent spreading the infection to your other toenails/fingernails or reinfecting your nails in the future. If you have a fungal toenail infection, then there are a range of different treatments available, varying in price, effectiveness and the range of side effects that come with these medications. These range from topical antifungal creams or sprays, laser treatment or oral medications. There are a wide range of topical antifungal creams and sprays on the market that are designed to treat toenail fungus. These include over the counter products like Loceryl® and Penlac® which can be very expensive to buy and are only available in pharmacies, and they typically have some side effects including a “burning” sensation which some users experience when applying these products to their toenails. There is a second group of topical antifungals that are designed using a combination of all natural ingredients and also include an oral spray that helps fight the infection on two fronts. Because they’re made from natural products, there are no nasty side effects whilst remaining highly effective. We’ll discuss them more later in this article. There are several oral prescription medications for fungal toenails, including Lamasil®, Sporanox® and Diflucan®. These medications are designed to be taken orally, travel through the blood stream and reach the nail matrix. The nail matrix is where your nail grows from, and so these medications are designed to treat your fungal nail infection from the inside of your body. They are highly potent, and as a result, there are a number of side effects of these medications as well as various medications that they cannot be combined with. Most importantly, they can cause liver problems – which means you need to have liver function tests before, during and after your course of treatment. This means they are not suitable for all people who have fungal toenail infections. While I have thought about making a second attempt to get a prescription for these pills (the first time, the lab were unable to grow anything from the toenail clippings that my doctor took), they are really a “last resort” type of thing and the side effects are pretty bad. The latest generation of treatment options for fungal toenail infections that everyone is talking about is using special medical lasers. The basic premise behind the laser treatment is that the fungus that infects your toenails tends to die when exposed to heat, so the laser is designed to heat up the toenail, nail bed and nail matrix (where the nail grows from), to between 104°F-140°F (40°C-60°C). There have been some studies released using small sample sizes that suggest that this treatment is effective, but the sample sizes are not large enough to be medically relevant. The two downsides to using laser to treat toenail fungus are the cost and the pain factor. Currently, laser treatment costs around $800 per one hour session, and most people will require 3-4 sessions to see any real signs of effective treatment. This expense is not covered by your health insurance, which means you need to pay the full cost of this treatment. Secondly, it is quite painful. The laser procedure requires your podiatrist to heat your toe up to 104°F-140°F in order to kill the fungus – and this can get quite painful, speaking from personal experience. I often had to ask my podiatrist to pause for a few moments because it was getting too painful. There is also a “burnt” sensation in the toes for a day or two afterwards as well, which can provide some discomfort when walking. There are a number of natural home remedies that have been bandied around for years that are finding their way onto the internet as cures for toenail fungus. I have created a page on this site dedicated to these home remedies. Personally, I’ve tried the Vicks VapoRub and vinegar/water baths with no real success. As mentioned previously, there’s a new generation of over the counter products that extremely effective. There are several products in this space, although the one that I chose to try was ClearNail Pro+. I liked the fact that I could buy it online, which meant I didn’t need to discuss my toenail fungus with another person at the local drug store and deal with that judging look from the store assistants that you always seem to get when mentioning that you have toenail fungus. As with any treatment plan, you need to stick at it meticulously to ensure that you get the desired results – much the same as you would for any diet or exercise program. This means ensuring that you apply the ClearNail Pro+ to the nail based on the instructions. I set alarms on my phone to remind myself to put the nail solution on. Given how long I’d had my case of toenail fungus, and how bad it was, I knew that it wasn’t going to go away quickly and some more time would be required. However, after about two months, I had started to see some new clear nail growing through. And after about four months, my toenail looked mostly healthy. I’ve totally cleared it up now, but I have decided to keep using it once a week as a preventative measure, to avoid any chance of a repeat infection. 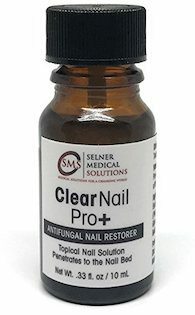 So, if you’ve been avoiding the beach for fear of people being disgusted by your unsightly yellowed, crumbly, thick toenails – or just want to be able to wear sandals this summer, then I’d highly recommend ClearNail Pro+. It’s the one product that actually managed to clear up my toenail fungus. Click here to go to the Amazon page for ClearNail Pro+ and buy it online. You do not address aging and the lack of circulation that might cause thicker toenails. Any ideas about increasing circulation to the feet? For tips on increasing circulation to the feet, you could try some simple home remedies like wearing compressions socks/flight socks – however, it is best to speak to your doctor to get treatment for poor circulation. My toenails are kinda thick but my real problem, that I cant seem to find any info on, is that I cannot cut my toenails very much. It is like the skin amd flesh of my toe is glued or stuck to the toenail. I tried to use one of those pedicure tools to clean between my toe and nail and it was the most painful experience ive ever had. Its like my skin is grown into part of the nail. When I look down into the front of my toe it almost looks like I have another nail growing under the toenail and above my toe skin but I think its skin because it has nerves in it. Any insight would be appreciated. I’d strongly recommend contacting a doctor about this, as they can investigate your issue further and perform any remedial surgery that may be required. I have the same problem, I can’t cut my toenail and I try to file it but, it is like it is stuck to the toe. I will have to see my podiatrist. I have the same problem and NHS do not touch thickening toenails. I would be interested to know if you resolved your problem. I’m not sure I entirely understand your issue Ruth. You should consult your doctor. Hi! So I have one toenail that is growing thicker like 2 layers and i’m pretty sure its from me doing track. Theres a bump on that one toe like you mentioned and under it is flat. So after the bump grows out, my toe will be back to normal? Possibly, although if you are concerned about it then you should consult a doctor. How do you use the vicks vapo rub? I have used vicks for fungus. I am going to try it for my thickened nail now 🙂 I just rub the vicks over the entire nail and underneath the nail in the morning and at night. It works! Be patient, you will not see results overnight, mine took about 3 months. My thumb nails and big toe nails thicken at the tips. As they grow, the tips that are thickened tend to come off from the nail beds. Underneath the thickened nails are are white crumbly debris (looks like dead skin). There are also white vertical pitting on them. I have tried topical and lacquer anti-fungal prescriptions. I have also tried the laser treatment. All these did not improve a bit my nail condition. I found another dermatologist who suggested performing a culture of my nails to check for fungus, the result showed that there were no fungus on my nails. The next procedure was cutting half of my big toe nail for biopsy, again the result showed no pathogens or conclusive evidence of a disease. Sometimes, I feel that the affected fingers/toes are like being squeezed and they hurt. I have been having this condition for more than ten years now and I have already seen four different dermatologists. Every time I see a dermatologist, I was told that immediately that they are fungal infections. If they are fungal infections, how come the infection has not spread at all to other nails. For more than a decade only the thumbs and big toe nails show the symptoms. The nail culture and biopsy did not show any kind of infection. I need to know a doctor who is expert on nails. I was doing some research on nail problems. What you describe kind of sounds like nail psoriasis. Ask the next doctor you see to look into that. My Second toe is really thick on the left side and then my right second toe is too. I went to go see a doctor about it awhile back and he told me that it was from sweating. I don’t know how you can get that thickness from it has to be a fungus. But my doctor said no it’s not. If somebody sees it because it looks so ugly it’s embarrassing. and then if you wear shoes you get that black stuff on top of it. and it’s so hard for me to get it off by filing it. But that black stuff won’t come off. but most people think it’s fungus but I don’t think it is it’s just from wearing the shoes and rubbing it on you know on my shoe. I’ve had this problem for a while and if I soak my feet in warm water or if I’m in my shower for a long time like almost a hour. my nails get really soft so that I can cut them. but they are so thick it’s hard to cut them off and it’s kind of hurts. So I better go and see my doctor soon and maybe he can cut it for me LoL. FLORENTINO that is exactly what my Thumb Nail and Big Toenail is doing. I have tried antifungal cream’s, spray’s and prescription medication for them but as of a year now trying everything to rid myself of the crazy looking “thick” and sore 💅 nothing has helped. I did have a heavy metal gate fall on my foot and across the nail but not the thumbnail. At first I thought maybe it was a fungus on the toe from walking in my yard in flip flops and the thumbnail from a nail salon that used a electric file on the nail bed and damaged it from cutting in the bed but it didn’t explain why both the thumb nail was thicker and growing out slanted and curved and then the toe doing exactly what yours is doing as it grows out. Now it’s been a good year that they are messed up looking as they grow. Any thing work for your nail’s yet ??? Thank you I’d appreciate your help if you found any. I had laser treatment on my toenails. It required 3 treatment and I can tell you it did NOT work. For years now the skin on the very tops of my 3 middle toes on feet have been peeling. The skin gets hard then starts peeling off. It happens every 2-3 weeks. The skin underneath looks healthy and pink. Also all my toenails seem to be getting thick with vertical lines through them. I think the toenails are changing due to age (I’m 56). But what is happening to the skin on my toes?